With the launch of Galaxy Note 9 imminent, information about the handset is pouring in from all corners. Adding to that is the latest leak from AndroidHeadlines, who have posted an image of the soon-to-be launched smartphone showing its front panel. From the looks of it, the handset will bear resemblance to the Galaxy Note 8, its predecessor. One can spot the familiar edge-to-edge Infinity Display, a trademark for Samsung smartphones for a while now. The handset is likely to come with on-screen capacitive keys as it has a slim chin at the bottom. The ‘notch-less’ top houses the front camera, iris scanner, speaker grille and the array of standard sensors. The right edge can be seen to house the power button, while the left edge houses the volume rockers and a dedicated Bixby button. However, since this image only showcases the front of the handset, it does not shed any light on how the handset will look like from the back or the software. As part of the rumours, it has been said that the Galaxy Note 9 will powered with a Qualcomm Snapdragon 845 processor in the US and China regions. The other regions will get the Exynos powered Samsung Galaxy Note 9. It is expected that the company may launch two variants of the device one with 6GB RAM and other with 8GB RAM, both offering 128GB internal storage and a microSD card support. The handset is likely to come with a 6.4-inch display with improved visibility under direct sunlight. The handset is expected to come with dual rear camera setup with improved ISOCELL technology and optical image stabilization and a massive 4,000mAh battery. 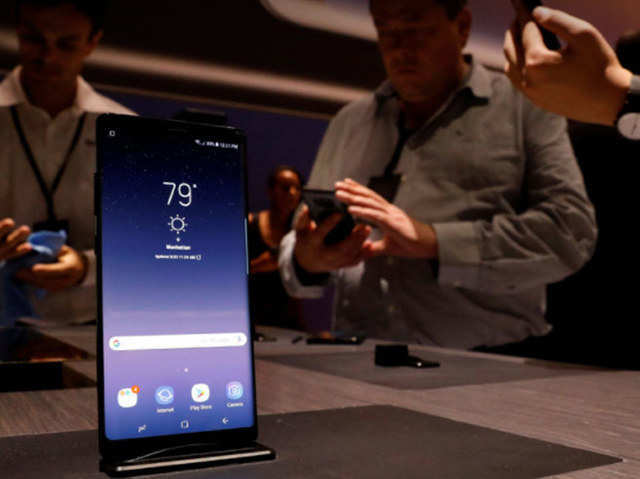 Samsung’s Noida mobile phone plant, its largest mobile manufacturing factory that was inaugurated by PM Narendra Modi and South Korean President Moon Jae-in on Monday, will start production of high-end Galaxy Note 9 from the end of this month. A senior official of the company said the new-generation device will also see manufacturing in India as it gets introduced globally. “The Noida facility is producing all high-end Samsung models. The production of Galaxy Note-9 will start from July-end and the device will likely hit the domestic market by August-end,” the official added.